Once again, I am attending the Information Governance Conference (InfoGovCon) in Providence, Rhode Island. 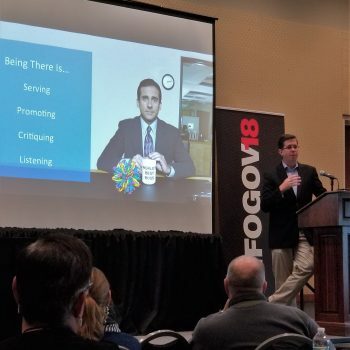 In addition to the excellent content during the main conference, The Information Coalition team added two new components to the agenda, the Leadership Summit and CIO Breakfast. I was honored to be asked to represent TeraThink and speak at the Leadership Summit. I shared many of personal lessons from my past and stressed the need for fresh leadership in the industry. However, I want to take a moment to share what some of the others discussed during the events. Throughout the Leadership Summit, Nick Inglis, the President of the Information Coalition, helped us assess what kind of people, workers, and leaders we were. When tied in with Kevin Parker’s lead-off talk and consistent insight throughout the day, we began to better understand how each of us work. This is critically important because everyone is wired differently. Knowing your own tendencies allows you to understand how to compensate for your own weaknesses. This is also important in understanding where people on your team may have gaps, how they can work together to get things together, and how to manage others. Understanding these tendencies can strengthen the team by creating a strong, effective, dynamic. Not all wiring is personality. Annalisa Nash Fernandez talked about how culture impacts how people perceive our actions. While the talk was more focused upon different countries and regions around the world, culture varies across the country and among our staff. At TeraThink and our clients, there are a lot of people who are 1st and 2nd generation Americans. Some have been raised with different cultural norms and as leaders, it is important to be cognizant of the differences. A key lesson was to not assume that any person or group thinks or perceives actions the way you intend. An effective leader must effectively connect with the people that they lead and with whom their team interacts. You have to understand people’s cultural differences and respond appropriately. Like the personality styles above, you have to adapt to be most effective. The morning after the Leadership Summit, Russ Stalters spoke at the CIO Breakfast. His talk would have fit into the Leadership Summit nicely. Russ is an experienced information governance expert and a retired US Naval officer. He led the development of multiple products in the information space and the information efforts at BP after the Deepwater Horizon oil spill in 2010. He know more than a little about leadership and the information industry. His key point was that leadership has to be developed on an ongoing basis. You cannot simply attend a conference and become a better leader. You have to work at it. This includes working with others on your own team, not just other leaders. After all, you need to develop the next generation of leaders as you developer yourself. Russ gave a few recommendations of some books to read, study, and discuss with others. I have to say, in my experience, this approach works well. I have found that studying any book of concepts works better when you gather have people to discuss the concepts in a book. It helps you extract the key ideas and tie them into real world examples. It was a great talk to bring help launch us on our way. Russ shared a story that was very similar to one I had shared the day before. He discussed a Monday deadline and how he supported his tech team over the long weekend. While he couldn’t code, he provided food, drink, and was there. He served his team. That is the take-away for any leader. Serve those you lead. If you are trying to lead the industry, share what you learn with that industry. Allow others to learn from your lessons and build upon them. That is what we have been doing here at TeraThink. We are out there sharing our lessons on content services, kanban, and many others. If you want to learn about the work we are doing, feel free to contact us. We are always happy to share our lessons. We are always learning how to solve new problems and old problems in new ways. Hopefully together we can push past our technical challenges and focus on doing things the right way and not the way a tech system has forced us.